In this article, we are going to see how you can search and filter your WooCommerce Subscriptions customers by their subscription next payment date. I’m also going to show you how you can create custom exports of your customers based on this field, which can be helpful for creating custom reports or sending the users to an email campaign. The next payment date in WooCommerce Subscriptions indicates when the customer is due to be charged for a subscription. The next payment date is calculated based on the date of the last payment made by the customer. This is to ensure the subscriber receives access to the subscription for the full period of each renewal. For example, if a customer purchases a monthly subscription product on 1st January and it gets renewed on 1st February, the next renewal payment date is calculated as 1 month from 1st February, which is 1st March. If the automatic renewal payment fails on 1st March and the customer then manually pays for the renewal on 3rd March, the next payment date is calculated as 3rd April, not 1st April. The WooCommerce Subscriptions module of Users Insights makes some of the customer subscription data available in the user table and filters. One of the fields that the module adds is the subscription next payment date. This allows you to search and filter your customers based on their next payment date field. The easiest way to list your customers by the most recent payment date is if you simply sort your customer list by the Next Payment field. In order to do this, first you have to make sure you have the Next Payment field visible on your user table. If this field is not visible on your setup, just make sure that you have the WooCommerce Subscriptions module activated (from the Users Insights Module Options page). Then activate the Next Payment column via the show/hide fields menu. Now, if you simply click on the “Next Payment” column title, you will get an ordered list of all your customers with the ones with earliest next payment date on the top of your list. The customers that have had their subscription renewed most recently will be at the bottom of the list. Please keep in mind that the Next Payment Date field should be treated as an estimate only, as the payment gateway determines when exactly payments are processed. 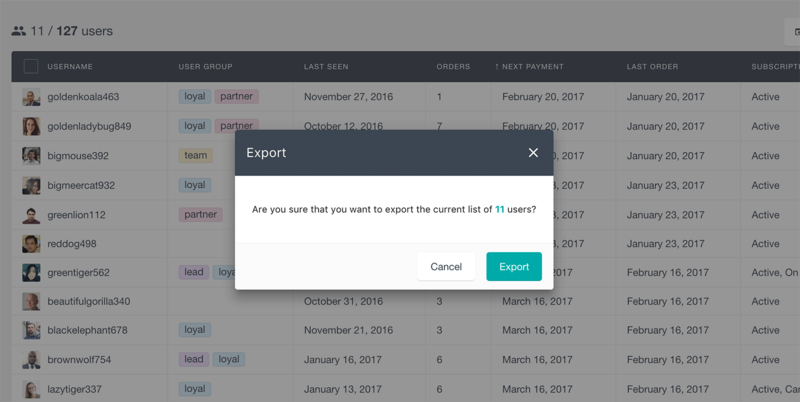 If you wish to export all the users whose next payment date is coming soon, you can easily do this by using the Users Insights custom export feature. All you have to do is to make sure that you have the proper filter applied and press the export button. Since the export functionality of Users Insights also automatically exports all the visible fields in the user table, you will have to make sure that you only have the fields that you want to be included in the export visible on the user table. You can control what fields are visible on the Users Insights table via the “eye” button menu. And that’s it! Now you know how to use the next payment filter to search and filter your WooCommerce subscriptions users with the help of Users Insights.